Acne scars occurs when acne is healing and the collagen formation is disrupted. Scars due to acne can be permanent if left untreated. The best thing to prevent formation of acne scars is to reduce the occurrence of breakouts. But, to lessen the appearance of existing acne scars, there are several procedures that you can talk with your dermatologist. A very popular and commonly-used treatment among many acne sufferers is dermal filler for acne scars. Dermal fillers can be an excellent way to get rid of acne scars, especially rolling scars and less defined boxcar scars. Dermal fillers are very safe and offer amazing results of filling skin depression associated with scars. This method is also effective for volume loss due to acne scarring. The dosage needed for acne scar filling differs. Factors such as the type of scarring, patient’s facial anatomy and the patient’s expectations must be considered. Dermal fillers provide great immediate results and it continues to enhance your looks after several months. Such improvement happens due to the technique of injection of the dermal filler, splitting some deep scars and stimulate collagen production because of the stretching of fibroblasts. Fibroblasts or the skin cells form the protein called collagen, which helps make your skin looking youthful and plump. Moreover, collagen also restores and repairs damaged skins. Acne scars, wrinkles and certain skin conditions destroy collagen. Dermal fillers are substances that are injected on the scars in order to smoothen them. Acne scars such as rolling, boxcar and ice pick can be effectively treatment with fillers because they help soften the scar tissue and blend with your normal skin. Dermal fillers are often used to restore facial volume and reduce appearance of fine lines and wrinkles. The process used for acne scars is non-invasive. Fillers usually last longer than for wrinkles or lip enhancements. The benefit may last for several months to a year or more. Sometimes, the filler encourage collagen formation in the area, providing permanent result. There is no healing time and the results are immediate, unlike laser treatments. We will apply a topical numbing cream on your skin to lessen discomfort. Ice may also be used to reduce pain and lower the risk of bruising. The first thing to do is to discuss which scars will be filled. Usually, patients have specific scars that particularly disturbs them more than other scars. Discussing the procedure allows us to get more information on what specific scars bothers you the most. After discussing which scars will be filled, the skin will be prepped with alcohol, ice will be applied to the area. Using a very fine needle, the doctor will inject the filler and then place pressure using gauze. Treated areas may be swollen, red and bruised for the first one week. Never get facial cleaning or massage for 2 weeks after the dermal filler procedure. Also, avoid alcohol and strenuous workouts for 24 hours if possible. They say that drinking pineapple juice or taking bromelain supplement may help resolve bruising faster. What Happens During A Wrinkle reduction treatment ? Wrinkle reduction treatment is one of the few cosmetic treatments that can truly be described as a ‘lunchtime’ procedure. The injections can be done in a matter of minutes (after a proper consultation) and there are usually little or no signs of treatment other than a bit of redness and in rare cases some mild bruising (Read: Wrinkle reduction treatment After Care Advice). It is important nonetheless to understand the actual Wrinkle reduction treatment Cosmetic procedure to its last detail. 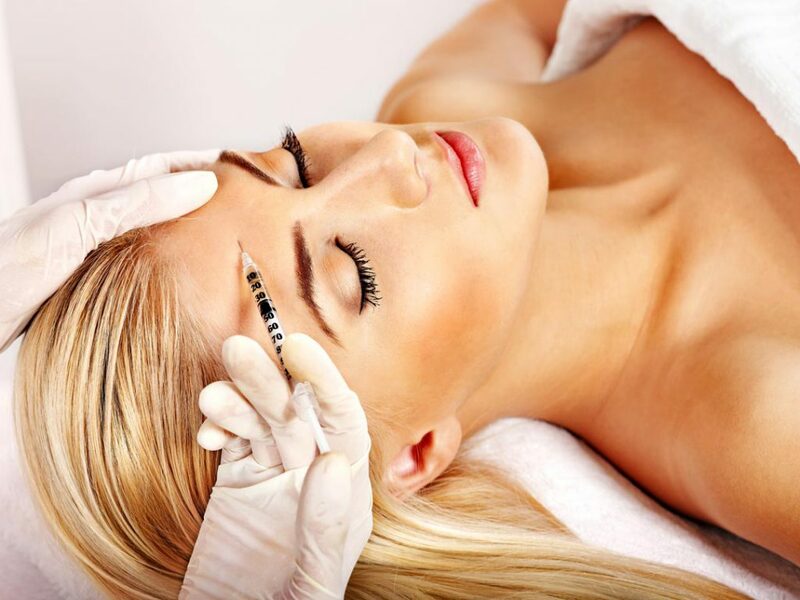 It might be a little scary to imagine as a needle is involved and injections are not something any one looks forward to but Wrinkle reduction treatment is nearly painless and if done right, you won’t feel a thing. So once you have decided to go ahead with treatment, here’s what you should expect! The doctor or nurse who is treating you will usually ask you to remove any make-up. They will then ask you to make facial expressions while they mark out the points they are going to inject. Small amounts of botulinum toxin are then injected into your muscles with a very fine needle. The material that Wrinkle reduction Injections come in are a crystalline substance from the manufacturer, which then has to be reconstituted with saline or another liquid. Practitioners add varying amounts of liquid when reconstituting the Wrinkle reduction treatment injection. Although there is no right or wrong amount of liquid to add, most physicians add about 2 ml-3 ml (about a half a teaspoon) of liquid to each vial of Wrinkle reduction Injections. Some add quite a bit more, which can lead patients to think they are getting more Wrinkle reduction treatment when, in reality, they are getting the same or less amount of Wrinkle reduction treatment than samples reconstituted in a stronger way. It is the total dose of medication, not the volume of liquid that leads to the desired effect. Therefore, it is important to remember that if a clinic or medical spa states that they are providing Wrinkle reduction treatment at a certain dollar amount per unit, it is quite possible that they are diluting the Wrinkle reduction treatment and actually not providing the agreed-upon amount. This is much like the concept of a watered-down drink at a bar, but the costs are much larger when it comes to Wrinkle reduction treatment or its alternatives, Dysport and Xeomin. It is also important to know that you do not need any kind of anesthetic for Botulinum toxin injections as they are virtually painless. You will feel a pinprick. Some areas, such as round the eyes, can be a little more sensitive but the treatment is so quick, it is very bearable. Some people do opt to have an anesthetic cream applied to numb the skin but for most it is not necessary. So the injection is normally carried out without anesthesia and takes only a few minutes, the time to inject 5-7 places of the face. The Doctor will then ask you to do some contraction exercises to “fix” the product. Small red spots may appear immediately after treatment, but they fade after a few minutes. Your Doctor will schedule a follow up visit in the coming weeks to ensure that the result exactly meets your expectations. If the toxin is not injected properly or if you are allergic to the Botulin toxin even for cosmetic purposes, it may cause the Wrinkle reduction treatment allergens to aggravate further. Great Wrinkle reduction treatment is directly proportional to a great Wrinkle reduction treatment injector. 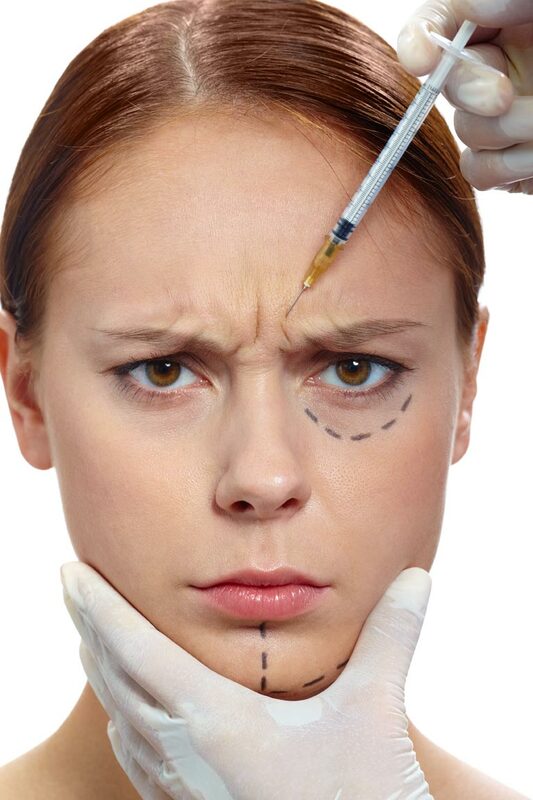 Why we say this is because although the notion of injecting Wrinkle reduction treatment may seem artless enough, in reality it requires the dexterity of a fully trained and experienced practitioner without which you are not only putting your face at stake but your health at a great risk. The Botulin toxin that powers any Wrinkle reduction treatment may spread from the injection site to other areas of the body and can have some very adverse effects, causing symptoms of a serious condition called botulism. If the toxin is not injected properly or if you are allergic to the Botulin toxin even for cosmetic purposes, it may cause the Wrinkle reduction treatment allergens to aggravate further. It is extremely important for this reason that you invest in a good Wrinkle reduction treatment practitioner and give them as much information as you can to avoid any discrepancies in your treatment. Any good Wrinkle reduction treatment Doctor will tend to your needs, listen carefully to what you have to say and will analyze your medical history in detail to check for any sort of Wrinkle reduction treatment allergens that you might have before proceeding with treatment. If you unfortunately find yourself in a situation where you are experiencing any of these Wrinkle reduction treatment allergen side effects, call your doctor immediately. Some of these might occur hours to weeks after you receive treatment. Although, previous research on Wrinkle reduction treatment , or Botulinum toxin, has found that use of the toxin can be a powerful ally against everything from cerebral palsy to multiple sclerosis to asthma and depression; the reason that Wrinkle reduction treatment is so good at controlling muscles is that it is a purified form of a nerve poison released by bacteria. When wielded by bacteria, it causes muscle paralysis and can be fatal. When its power is wielded in a gel, Wrinkle reduction treatment blocks the chemicals from spreading from nerve endings. That disruption plays a huge role in disarming symptoms and formation and aggravations of Wrinkle reduction treatment allergens. Wrinkle reduction treatment is an art and a science. The provider should be very knowledgeable about the anatomy, the chemistry and side effects. The artistry comes from both experience and an innate sense of observational skills and a keen interest to learn constantly and improve on the outcome. Having said, there can’t be enough emphasis on getting a proper consultation. Be as open as possible with your doctor about the risks and benefits of getting this treatment as there can be a likely possibility of it not being the right choice for you. Tired of those imperfect 11 number lines on your forehead? Worried that you might be getting old? Wrinkles don’t always indicate the signs of old age; there are other factors than age that might cause those creases to creep up on your forehead and also on other parts of your face, whether they are vertical or horizontal. There’s nothing more annoying than standing in front of the mirror and staring at the vertical line etched between the brows on your face that give your face an “angry face emoticon” look, even when you are not angry. A lot of things and bad habits can result in lines and grooves ranging from smoking to the way you sleep on your pillow. A less obvious cause of wrinkles however are the repeated expressions you make. How are No. 11 wrinkles in your forehead formed? A wrinkle or frown lines are typically formed perpendicular to a contracting muscle located directly beneath it. As an example, the muscle in your forehead is what is termed a vertical muscle. When you raise your eyebrows e.g it contracts forming horizontal wrinkles. Similarly the duo muscles that control for the frown lines are located slightly horizontally close to the eyebrows. When these contract, the frown lines will appear vertical. Here at Skin Hampshire when we inject wrinkle reduction treatment into the muscles, it blocks nerve impulses to those tissues. The muscle activity that causes the frown lines thus is reduced and a smoother look forms up. Without a contracting muscle beneath it, the skin has a difficult time wrinkling and the wrinkles between the brows begin to disappear. For candidates whose facial lines even appear with a relaxed face are not very good subjects for Wrinkle reduction treatment . You would be better served by dermal fillers. Wrinkle reduction treatment can also be used frequently to “soften” these lines but it’s not always the best way to be rid of them. Wrinkle reduction treatment is therefore recommended highly for the treatment of wrinkles between the brows more likely than the wrinkles that are on the other parts of the face. Being young has a lot of skin advantages. When you’re children, your skin keeps itself hydrated automatically and recovers quickly from scraps and bruises. As teenagers, a small blemish or acne might interrupt your otherwise soft and supple skin and even up to late 20’s despite the parties that go on night after night, your skin still remains firm and wrinkle free mostly because of elastin fibers and collagen found in high levels in your body. Yet the 30’s arrive and our skin’s natural processes and collagens don’t work at the same levels and the once nearly blemish free, fairly smooth, firm and supple skin starts showing small lines and wrinkles especially between the brows that were never there before. From the forehead, the eyes and the mouth, all start getting affected. We also see the loss of definitions of high cheek areas, hollows develop under the eyes, the cheek fold starts becoming more prominent, our lips may thin and even jowls may form and to make matters worse, all this breakdown makes your skin more vulnerable to more attacks by external factors including sunlight, pollution and even emotions and moods. Wrinkle reduction treatment thus is normally used is used to reduce or eliminate the look of aging (see: how does wrinkle reduction treatment work) which helps you shrink the appearances of wrinkles on your face, neck, and hands. Nothing explodes your confidence than the day you look onto your reflection in the mirror and find wrinkles and signs of aging appearing on your skin. Seeing those imperfections on your face might even cause you to worry more and that on it on results in you having more worry lines and creases, creeping up your forehead. Wrinkle reduction treatment cosmetic treatment helps trim down age signs and gets back your smoother skin. It will also help revitalize and rejuvenate the freshness of your skin. We’ve helped a lot of people with choosing the right anti-aging Wrinkle reduction treatment in Basingstoke with a successful history of results against all matters of wrinkles and age signs, helping them look gorgeous and radiant. Botulinum toxin injections can help reduce facial wrinkles and deep lines such as frown lines, forehead lines and squint lines called crows feet usually found in the corners of your eyes. Botulinum toxin is a protein, which is injected into specific areas on your body depending on results required. This will relax these muscles and reduce that muscle effect on lines and wrinkles. Untreated areas of your face will continue to function and move as normal and not affect your ability to laugh, smile and frown and without causing wrinkling of your skin in the treated areas. It may take three to seven days for the treatment to take effect and the full results of the treatment. So stop looking at the mirror with worry and contact Skin Hampshire for your Wrinkle reduction treatment needs. We can help as we’ve helped hundreds of others like you to live life.